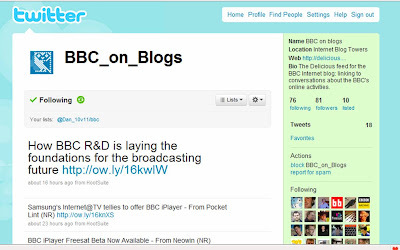 "'BBC on blogs'" is shorthand for 'Conversations about BBC online, BBC iPlayer, the BBC's digital services and the technology that underpins them, including blogs, message boards and articles where you can comment'". The BBC's Nick Reynolds explains more about the editorial process behind selecting the links on the Internet Blog. All in all, a good idea and very useful for people me.